Everyone claims they are Irish on St. Patrick’s Day. The excuses for wanting to be Irish involving wanting to ask people to kiss you and being able to drink green alcoholic beverages, sing loudly, wear green, and mostly have a great time. Why would you not want to be Irish today? Fact is, Shannon and I are very Irish. I mean, seriously, with a name like Shannon and Meaghan you would think we still lived in Ireland. And for our being Irish, my closet is nearly empty when it comes to green clothing. And green bags, lacking as well. I guess I am not a fan of green on myself, though it seems to compliment my coloring and eyes just fine. That needs an update. 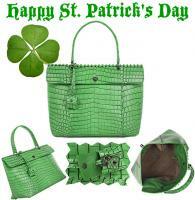 So for St. Patrick’s Day I wanted to find you all the greenest of green bags in a gorgeous design and beautiful skin. Of course Bottega Veneta has it and of course it is sold out and of course it costs $24,000. What I really wonder is how many people were sitting around this morning with $24,000 in their account waiting for this very bag to pop up on Net A Porter? At least one person was, and I would imagine they had more than one bag in stock. Nevertheless here is the Bottega Veneta Cocolave Crocodile Tote, a bag we gave you a preview of Spring 2010 Bottega Veneta bags back in November. Bottega Veneta also calls this bag the Esperanza Cocco Lave Bag. I call is gorgeous. And green! The color green is vibrant yet not obnoxious and the pewter hardware is the perfect compliment toward the crocodile skin. The top adds a new dimension with Intrecciato and eyelet detailing. When it comes to Bottega Veneta, the quality of every aspect of the bag is taken into account. Inside there is taupe suede lining, a zip-fastening pocket, and a pouch pocket. If you have $24,000 and love Bottega Veneta and green, this is the bag for you. If not, it is the perfect bag to check out and remind yourself to wear something green today! Buy through Net A Porter for $24,000. Happy St. Patrick’s Day! 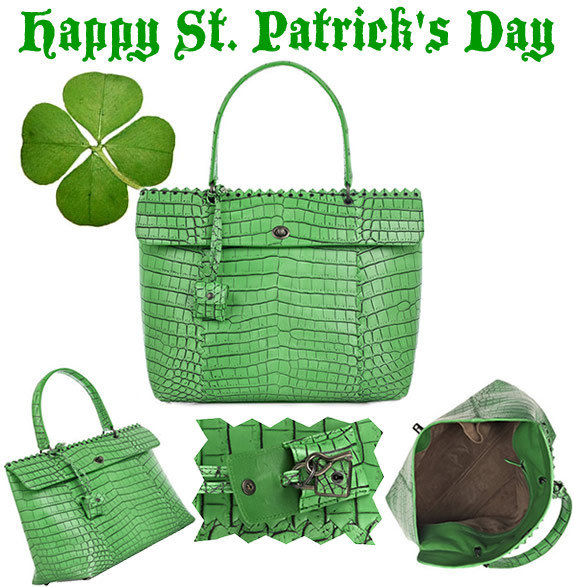 Have fun, be safe, and wear green: What green items are you wearing or carrying today? Please ID this BV - Style, Color, Age - Post here!